Yesterday I shared how I learned to play guitar, by mimicking the exact finger positions of my favorite guitarists and practicing over and over. That got me thinking about awesome people and why they’re awesome (and seemingly keep getting awesomer). Guys like Dave Pensado an Micheal Burt. You’ve probably heard of Dave. You’ve probably never heard of Micheal. Dave’s an award-winning mix engineer. The guy has every reason to be an arrogant jerk, but he’s not. Instead he runs a regular internet show, where he interviews other successful engineers about their techniques, and he shares his own advice with his audience. What’s cool about Coach Burt (he’s a former basketball coach) is that although he knows more than me about business, he doesn’t act like it. In fact, he learns things from his clients, even me! A few months ago I was talking with him and told him he should figure out a way to do some sort of membership model with his business. (He does lots of workshops, etc.) I shared with him how my VIP membership and Dueling Mixes work, and he was intrigued. A few months later, he rolls out a membership model. Now I’m sure I wasn’t the catalyst behind it, but I like to think I played a part in it. And THAT is what makes Coach Burt and Dave Pensado awesome. They teach lots of people. But they are also TEACHABLE. You don’t have to know more than someone to teach and help them. Eager to be taught something new. Eager to apply what they learn and become even more awesomer. 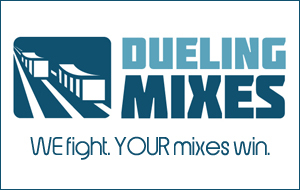 Do you think your mixes have room for improvement? And Dueling Mixes could be the solution.